One of the newer additions to our roster of products is Vee Rubber. Based in Bangkok, Thailand, Vee Rubber has an expansive range of MTB tires that offer quality traction with tremendous value. For more information check out www.veerubberusa.com. Vee Traction Power: VRB.330 The Traction Power or TP for short is a general use mountain bike tire. Tapered and ramped knobs on the top and in some transitions areas help with traction and cornering. Long edge transition helper knobs give extra corner control. Built with Folding Bead (FB), Dual Compound (DC) and 120 Threads Per Inch (TPI) casing material- this is considered a Medium (M) condition use tire. Vee Race-V: VRB.328 The Vee Race-V is designed to be a winner be it for racing or general riding. Ramped and tapered center knobs for traction combined with diamond shaped transition knobs give great control. Tie bars between side knobs and transition knobs add control in corners. This tire is built with Folding Bead (FB), Dual Compound (DC) and has 120 Threads Per Inch (TPI) casing material. 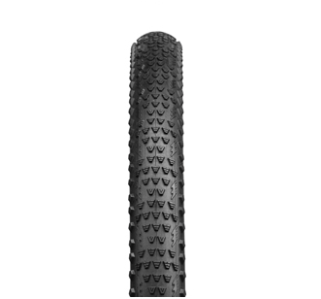 This tire is intended for multi-trail conditions but works best on Soft – Medium (S)-(M) conditions. Vee Flying V: VRB.326 The Vee Flying-V is for mountain or cyclocross use. Tapered ramped center knobs help with traction. Long side knobs for cornering. Made with Folding Bead (FB), Dual Compound (DC) and 120 Threads Per Inch (TPI) casing material, we recommend this tire for Medium-Hard (M)-(H) conditions. Vee Mission: VRB.321 The Mission is for mountain bike trail riding or racing. Ramped and chisel shaped center and transition knobs set this tire apart from the others. Diamond shaped extra transition knobs provide great cornering. The tire is constructed with Folding Bead (FB), Dual Compound (DC) and 120 Treads Per Inch (TPI) casing material. As the knobs provide superior traction, we recommend this tire for mainly for Medium – Hard (M)-(H) conditions but it can be used for many trails. Vee Speed-R: VRB.324 The Vee Speed-R is intended for all conditions usage. Tapered and ramped center knobs along with ramped transition knobs provide traction and control. Tie bars connection diamond shaped transition knobs to side knobs help with cornering. Built with Folding Bead (FB), Dual Compound (DC) and 120 Threads Per Inch (TPI) casing material. Intended for Soft-Medium (S)-(M) trail usage but could be used for other applications.